Jawai Bandh is a dam built across the Jawai river, a tributary of Luni river. With the same name, a village is also situated near to the dam and a railway station on Ajmer-Ahmedabad route. It comes under Sumerpur Tehsil of Pali district in Rajasthan. It is 24km from Bali. The dam is situated near Sumerpur town in Pali District of Rajasthan state in India. The dam was built by Maharaja Umaid Singh of Jodhpur. The work started on 12th May 1946 and it got completed in 1957. Total expenditure was Rupees 2 crore 7 Lakhs. This village covers an area of 500 km. This is the biggest dam in Western Rajasthan. The dam has capacity of 7887.5 million cubic feet and covers an area of 102,315 acres (414.05 km2) of cultivable command area. Its height is about 61.25 feet (18.67 m). Sei dam and Kalibor dam are the feeder dams of the Jawai dam. Besides being a Winter paradise for migratory birds, It is the main water supply source for Jodhpur city and parts of Pali district. If there is sufficient water in the dam, then some villages of Jalore district and Pali district gets water for irrigation from the Jawai dam, which was the main aim in making this dam. Jawai Dam Crocodile Sanctuary with Indian & Migratory birds & Kambeshwarji Leopard sanctuary is situated nearby. One can see sarus cranes, comb duck, spot bill duck in the dam. During the winter, demmossile, common-eastern-crane, barheaded-geese and migrating birds descent on the water. Crocodiles bask on the dam shores. There are Panther, Bear, Hyena, Wolf, Nilgai and Chinkara in the hills around Jawai dam. Sometimes one can see Jackals and Jungle cats drinking water at the dam. Newspapers- can be used for lining a bird cage. Brown paper bags; packing paper and newspapers can be used to light a fire. Choose cardboards over plastic bottles and bags. Get the plastic of your face. Use compact fluorescent lights as it saves energy and less greenhouse gases will get into the air. Use compositing bans to turn organic waste into usable mulch. 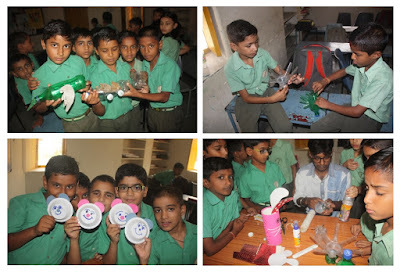 Tuesday, 5th July: Craft Activity to reuse waste from home was carried out in Class IV and V. Students brought materials from home made decorative pieces to decorate their class. Saturday, 9th July: School observed an Activity Day. They had their society meeting in the first hour. After that the classes attended Music, Art & Craft and Sports Classes. In the last hour teachers carried out Life- Skill lessons in their classes. In life skills they had lessons on peer pressure, reflection of one’s own self, good manners, good habits etc. Tuesday, 5th July: Environment week was organized. The theme was Recycle, Reuse, Reduce. A Special Assembly was held every day for students to speak about ways of keeping a healthy environment.. Mrs. Prerna Rathod spoke about the ways we can reuse, recycle and reduce. Suyraveer /X/DH: Spoke on the ways we can reduce the use of materials harmful for the environment. Muskan Rathod/ X/TH: Spoke on recycling paper. Kreena Rao /VIII/DH: Spoke on Reduce, Reuse and Recycle. Krisha Dave/VIII/GH: Spoke on ways to reuse paper. Vinita Sirvi/VII/ GH: Spoke on ways to reuse plastic. Manvendra Singh Sonigra/X/DH: Spoke on Importance of 3R`s in the school. Tuesday, 5th July: Workshop was held for the faculty during the PDP Session by BAT Chairman Mr. Sandeep Dutt. He shared the PDP Plan with the faculty and told them how they will be assessed. He also shared with them the concept of introducing Good Schools and Happy Teachers concept. After one hour session group leaders had meeting with Mr. Sandeep Dutt. Rest of the staff had HOD meeting with their respective departments. Students who passed Class XII have all settled down in their fields. Mayur Rathod will be doing Hotel Management from Goa, Mohit Malviya has taken admission in BCA in Lonalva, Khushagra Singh has taken admission in MET College, Jaipur. Bajrang Singh is doing BBA from St. Xaviers College, Jaipur, Vaishali Rao is doing Bcom. along with CS from LPS Vidhyawadi Rani. Mamta Chouhan, Chandu Gaur & Neeraj Panwar are doing BSc. from Jodhpur.